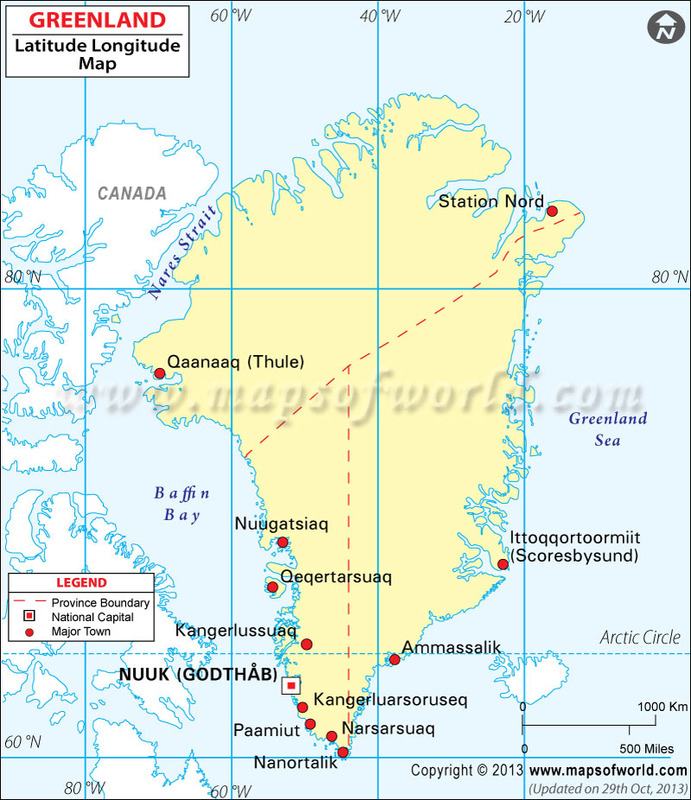 Greenland's latitude and longitude is 72° 00' N and 40° 00' E . Below is the map of Greenland showing major towns, roads, airports with latitudes and longitudes plotted on it. The latitude and longitude of Greenland is 72º 00' N and 40º 00' E respectively. It is located on the northern part of North America and lies between Arctic Ocean and North Atlantic Ocean. The total area is slightly more than three times that of Texas. Greenland comprises of three administrative districts and eighteen municipalities. Nuuk, the Capital of Greenland is located on 64º 11' N and 51º 44' W latitude and longitude respectively. Greenland is 2 hours ahead of Washington DC during Standard Time and is divided into four time zones. The total area of Greenland is 2,166,086 square kilometers and the coastline extends for 44,087 kilometers. The terrain of the region is flat but gradually sloping icecap covers almost all parts except a narrow rocky coast. The climate of Greenland is that of arctic of sub arctic type with cool summers and winters. Continuous permafrost over the northern two-third parts of the island is the greatest natural hazard of the region. Greenland is regarded as the world's second largest ice cap.